TORONTO, July 16, 2018 /CNW/ – Laramide Resources Ltd. (“Laramide” or the “Company“) (TSX:LAM; ASX:LAM) is pleased to announce it has entered into a sale and purchase agreement (the “Agreement”) with Rio Tinto Exploration Pty Limited (“RTX”) pursuant to which the Company will acquire a 100% interest in the Murphy Uranium Tenements in Northern Territory of Australia (the “Project”). The new Agreement replaces an existing Farm-In and Joint Venture on the Project between Laramide and RTX. That earlier agreement has now been terminated and superseded by the Agreement with terms as further detailed below. 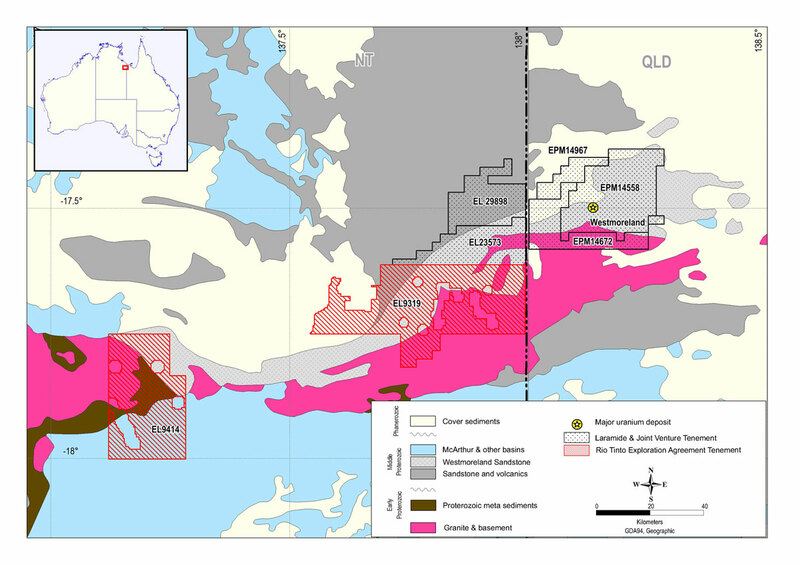 The strategically located Project is 683.5 km2 of granted exploration tenure, which lies contiguous to and along strike from Laramide’s Westmoreland Project in northwest Queensland. The Project will enhance Laramide’s dominant landholding in a highly prospective and underexplored uranium province. The Northern Territory of Australia is a jurisdiction that is supportive of both uranium development and mining and hosts several well-known deposits including the Ranger Mine which has produced in excess of 120,000 tonnes of U3O8 over a 35-year period. The new Agreement is structured to incentivize a return to active exploration on the Project while providing RTX with an opportunity to participate should a world class discovery be made. a further payment of AUD$150,000 on or before the date which is 24 months from the closing date. Laramide can elect to make these payments in cash or common shares at the Company’s discretion. Should the common share option be selected, the common shares (or CDI’s) will be issued to RTX at a price which is at a discount of 10% to the value of the weighted average price of the common shares on the TSX over the 10 days prior to the date of issue. The Agreement allows for RTX to have Clawback Rights, a Production Payment, an NSR Royalty and Rights of First Refusal under certain conditions. The Clawback Rights can be exercised, on a one-time basis, if Laramide discovers and develops a Measured and Indicated Mineral Resource Estimate on the Project with an In Situ Value estimated in excess of US$1 billion (US$1,000,000,000). This would allow RTX to Clawback a 51% interest in the newly formed (the “Joint Venture“) on payment to Laramide of two times their expenditures to that date. Unless and until RTX has exercised, or waived, its Clawback Right, Laramide would also be obligated to make a one off payment equal to 1% of the Pre-Production Expenditures (the “Production Payment“) on the Project from first revenues and also reserves for the benefit of RTX a net smelter return royalty of two per cent (2%) in respect of all product produced from any mining within the Project Area. RTX will also retain a right of first refusal over future divesture of the Project under certain conditions. The Project comprises exploration licences, EL 9319 (411 km2) and EL 9414 (272 km2), together with several associated exploration licence applications, which are situated geologically within the highly prospective Murphy Uranium Province. The Murphy Uranium Province produced high-grade uranium during the 1950s and stands out amongst the world’s attractive underexplored uranium provinces, having not seen any meaningful exploration since the 1970s (see press releases May 16, 2011; October 6, 2014; and, May 24, 2016). Closing is subject to certain regulatory approvals and processes with respect to title transfers and would be expected to close sometime in Q3, 2018. A resumption of active exploration would immediately follow the closing and will benefit from the airborne geophysics previously completed by Laramide in 2016 and from the ongoing Geoscience Australia (GA) AusAEM survey which is scheduled for completion this year http://www.ga.gov.au/eftf/minerals/nawa/ausaem. Further details of this program will be released on commencement.